This week Marc and Matt are reviewing the Fine Woodworking title “Small Tool Cabinet” by Garrett Hack. Enjoy time in the workshop with master craftsmen Garrett Hack. 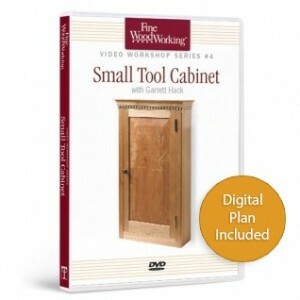 Our video workshop DVD series was developed to demonstrate important woodworking techniques while building a specific project – such as this traditional tool cabinet. In this nearly one-hour video geared for intermediate and advanced woodworkers, hand-tool expert Garrett Hack reveals many of his trade secrets. « Fastest Way to Her Heart – Wooden Jewelry?